New Brunswick, N.J. – Commitment, compassion and dedication are just a few of the many attributes exhibited by nurses and advanced practice providers at Rutgers Cancer Institute of New Jersey in providing comprehensive care for oncology patients. To recognize the scope of their work, which also includes leadership, peer mentoring and research, they were celebrated this week with Oncology Nursing Excellence Awards given during the annual Elizabeth Gibby Osborne Lecture. Recognized for her excellence in clinical practice and “customer service,” physician assistant H. Nivita Singh-Bulkan, MHS, PA-C of Franklin Township (Somerset County) was selected by her peers as this year’s award recipient in the category of Advanced Practice Nurse/Provider. 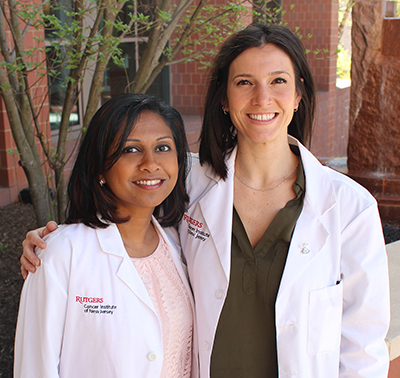 Known for her “warm, calm and caring demeanor” by both colleagues and patients, Singh-Bulkan is part of Rutgers Cancer Institute’s Hematologic Malignancies Program. Having been with Rutgers Cancer Institute since 2014, she is known for going the extra mile to accommodate patient schedules and is heralded for her efficiency and expertise in the delicate task of performing bone marrow biopsies and lumbar punctures. Her peers note she has an “unfailing dedication to the team” and is “versatile - having critical thinking skills, patient assessment skills and management of patient treatments,” as well as having covered extended leaves for advanced practice nurses in the Hematologic Malignancies and Gynecologic Oncology Programs. Described by her colleagues as “a dynamic clinician,” nurse clinician Lauren M. LiBrizzi RN, OCN of Bridgewater Township (Somerset County) was recognized for the award in the Generalist Nurse category. A nurse for six years, LiBrizzi supports the Gastrointesintal/Hepatobiliary and Surgical Oncology Programs and is recognized for her thorough understanding of patient disease and comorbidities and how those elements impact the treatment plan. Known for her “patient care commitment,” LiBrizzi is said to be “invested in her patients,” knowing who needs extra help navigating appointments or social work services and even recognizing the unique needs of family members and caregivers. Committed to improving her knowledge base and practice scope, LiBrizzi is currently studying to become an advanced practice nurse. The Elizabeth Gibby Osborne Lecture capped the awards event and featured Laurie Guest, CSP, a certified speaking professional, author and entrepreneur with more than two decades in the healthcare field. During her talk “Life in the Espresso Lane: How to be Smooth, Bold and Balanced in a Fast-Paced World,” Guest used humor to deliver a practical point of view on customer service and staff development and provided tools and tips on how to become engaged, motivated and energized in one’s daily work. The lectureship and Nursing Excellence Awards are underwritten in part by the Elizabeth Gibby Osborne Endowment Fund for Nurses Education. Because of Mrs. Osborne’s strong belief in education, her husband Bill established the fund after her death from cancer in 2004 to support peer learning opportunities for oncology nurses at Rutgers Cancer Institute.